A few tweets from Kate Pahl’s visit to Teachers College and the Center last week, chock full of links and other little tidbits of goodness to ponder! #cmll what does utopia as a method look like in making things happen and creating emergent spaces in communities? CMLL is thrilled to help sponsor ILA’s Annual Conference. This year’s theme, “Linguistics and Education,” is a perfect match for current ILA president Jo Anne Kleifgen, who is also one of the founders of CMLL. See below for more information about this year’s conference. On the occasion of the 60th Annual Conference of the International Linguistic Association, we pay special tribute to Franklin Horowitz, who has been an active and dedicated member of the ILA from its earliest years, serving both as an ongoing member of the Executive Board and as ILA’s president from 1999 to 2002. A professor of linguistics at Teachers College, Columbia University for over 35 years, Frank’s enthusiasm for language inspired legions of students, who continue the work of teaching linguistics to their own students around the world. His influence has been enormous, both as a leader of the ILA and as a teacher. Thus, this year’s theme reflects the mark he has left on those who have worked with and learned from him. WORD Global Roundtable. On the occasion of the re-launch of WORD , journal of the ILA, Teachers College, Columbia University and Beijing Normal University will host a simulcast roundtable co-chaired by WORD ‘s managing editor Jonathan J. Webster and ILA’s president, Jo Anne Kleifgen. Our panelists will be Sheila Embleton, Michael Halliday, Ruqaiya Hasan, William Labov, and Jacob Mey. Rethinking the Relationship between Linguistics and Education. Betsy Rymes, Andrea Leone, Mark Lewis andNelson Flores of the University of Pennsylvania’s Graduate school of Education, will explore themes in language research in education. The Writers’ Sentence: From Casual to Formal Writing. Alice Deakins of William Paterson University and colleagues will present four increasingly complex levels of the English sentence, including both grammatical conventions and stylistic power. At each level, the structure of the sentence will be discussed followed by practice in a game format. Having Fun with Words. Kate Parry of Hunter College, CUNY and colleagues will focus on the problem of learning infrequently encountered vocabulary. Participants will engage in games or exercises requiring interactive discussion about the selected words. Materials that teachers can use with their students will be provided. Click here for more complete information, including details about registration and lodging. Kate Pahl, our CMLL Visiting Scholar, will be in residence at Teachers College this month, April 13th – 15th. There will be several opportunities for anyone interested to learn more about her work. 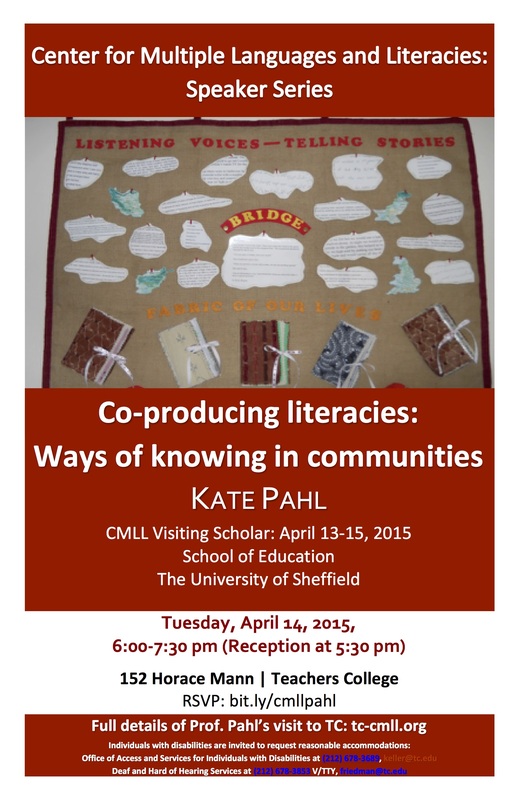 Kate Pahl is Professor of Literacies in Education at the University of Sheffield. She is the author of ‘Materializing literacies: The uses of literacy revisited’ (Bloomsbury 2014). Additional opportunities to meet with Dr. Pahl will be posted as they are finalized. On April 14th, she will present in our Speaker Series: Co-producing literacies: ways of knowing in communities. This presentation will describe a collaborative ethnographic research project that is currently underway in Rotherham with a focus on ‘Imagining better communities and making them happen’ funded by the ESRC through the Connected Communities programme. At the heart of the project is an exploration of how different ways of knowing or ‘unknowing’ (Vasudevan 2011) can inform understandings of community literacy practices. Drawing on the concept of ‘materializing literacies’ as a touchstone for generative research, this presentation will describe different understandings of literacy in communities.These ways of knowing incorporate textiles, art-work, images, oral stories and draw on the magical spaces of the everyday. This presentation will re-think the way literacies are conceived and understood through collaborative ethnographic research with girls and women, using literary and post-colonial theory. By bringing together a hermeneutic understanding of the social, drawing on post- colonial literary texts, a complex picture of literacy as meshed with ‘the fabric of our lives’ will be presented. This presentation draws on Pahl (2014) – an approach to literacy that combined multimodality with aesthetic and literary theory together with the New Literacy Studies to re-think how literacy is understood within multilingual community contexts. Learn more about Pahl’s work in her article titled, “The Aesthetics of Everyday Literacies: Home Writing Practices in a British Asian Household,” recently published in Anthropology and Education Quarterly.